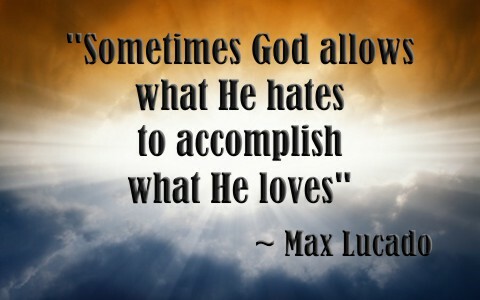 Pastor Max Lucado is a Texan, born and raised. Not only that, he is a gifted writer and speaker. Take a look at some of the other interesting things that I found about him in this overview of a great Christian writer. Born in 1955, Max is the baby with three older siblings. He wanted to be a lawyer and attended college for that purpose at Abilene Christian University. As sometimes happens in college, he changed his mind on that major after just one Bible course and a mission trip. He felt a strong calling to be a missionary and therefore changed his field of study to Bible and Biblical Studies. He graduated college and became involved as a minister for a single’s group in a church in Miami, Florida where he also married Denalyn. Together they answered a call to serve as missionaries to Brazil. They served there for five years until the death of Max’s dad. He and his family then moved back to the United States so that Max could be near to his mother. After just 2 years as Pastor of Oak Hills Church in San Antonio, Texas, Max had become such a successful writer that he told his congregation that he no longer needed a salary from the church. He served as the Senior Pastor at that church for 20 years until health concerns caused him to step down for a time. Even though he is no longer a full time pastor at Oak Hills he still serves as a preacher. Pastor Lucado has written nearly 100 books and you can find them online and at any book store. He even has some mobile devotional apps available for free download to Android and iPhone products. Max Lucado is gifted by God to share God’s promises through his many, many published works. He is inspirational and honest. He is humble and bold. I am thankful for this great Christian writer of our time. Thank you Pam. I truly believe that God used this man so mightily because he remained humble and God can only use a man or woman who remains so. This man is a great writer and has helped strengthen many people’s faith. Previous post: What Does The Bible Say About Drugs?